Happy Thursday! I'm excited to start sharing the quilts I've been finishing lately! I've been on a mission this year to work from my stash, but also to make things just for fun. Part of this means using fabrics that I've been hoarding. Another part of that is making things I've always wanted to make. It's been reinvigorating on the creative side, and now I can really enjoy those precious fabrics in finished projects. 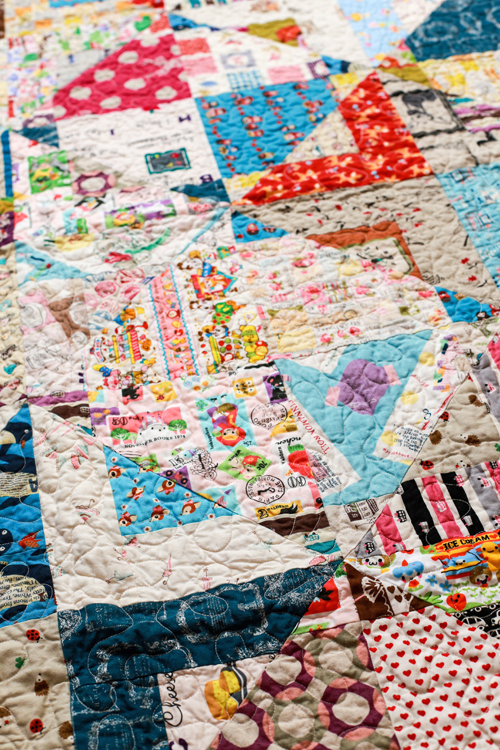 Today I'm sharing my Kawaii Magic Stars Quilt! In January 2013, I participated in a Kokka Layer Cake Swap. We each bought yardage of a single print, cut it up into 10" squares, and swapped to end up with a layer cake of 26 different Kokka prints. At that time I was just starting to splurge on Japanese prints, and didn't have much of a stash of kawaii (ie: super cute) fabrics. There were so many good prints in the resulting layer cake, and it was immediately deemed too precious. Fast forward to this Spring, when I decided to add to the layer cake using prints from my collection of kawaii prints that I've collected over the years. 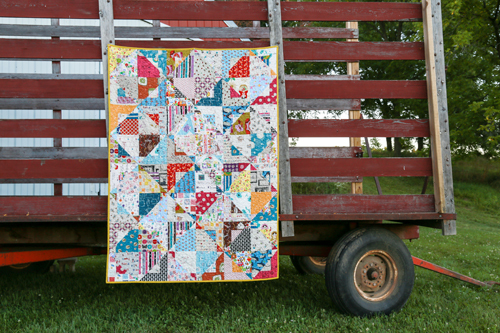 I chose the Magic Stars Quilt Pattern by Aneela Hoey to show off these prints. 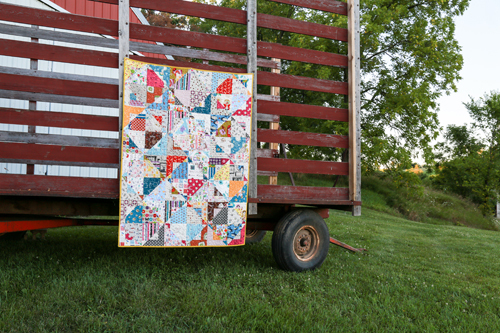 I loved working on this pattern when I made my Mom's quilt: Emmy Grace Magic Stars Quilt. It's a really fun pattern, and I'd make it again! I did one thing wrong this time that resulted in a much scrappier look. I didn't pay as close attention to the directions this time around and forgot to pair like blocks together in the last step. This was 100% my error, and was definitely a result of "I've already made this, I know what I'm doing". It happens to us all! I think there is so much going on with the prints that it's okay. Just like the first time I made this quilt, I added an extra row of blocks to make it a little bigger. I like the little bit of extra length and it completes the final row of stars. I pieced together a backing of more Japanese prints, including a big chunk from a friend. 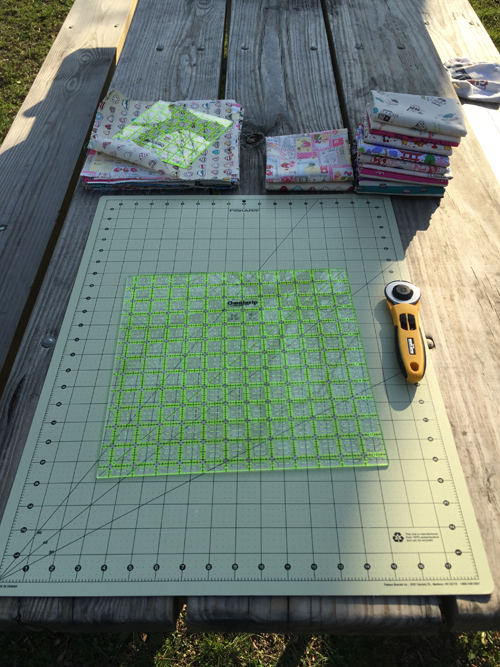 It felt good to use up some yardage as well as a few smaller pieces. 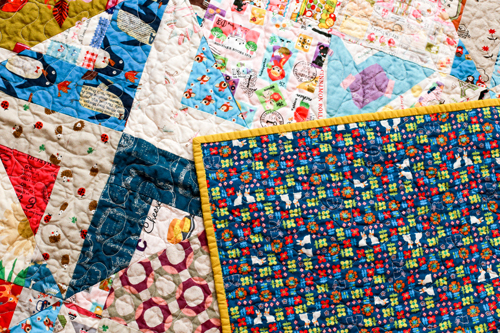 This quilt was quilted by local Madison quilter, Gael Boyd of Stitchlilly. Thanks for a beautiful job Gael! It's bound in Sprout Cirrus Solid from Cloud 9. 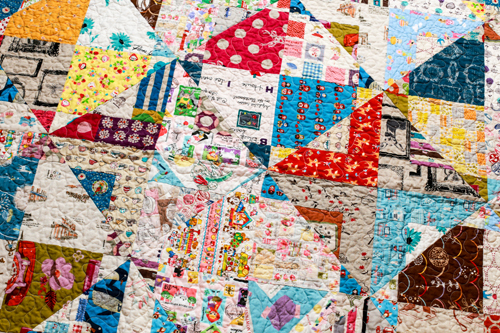 I love your quilt from start to finish and I especially love that you allowed yourself the pleasure of a mistake....a mistake that made your quilt ever better (from my perspective) than it would have been. I think we often rip too soon rather than wait to see what might be. Thanks! I had to sit with it for a second before I was okay with moving forward. It would have taken the fun out of it to do all that ripping! Oh my goodness... what a great idea. Would love to be able to do a 10" square exchange like that. Gives you such a variety and of course I am a fabric junkie. Your quilt is great. Right? It was such an easy way to get a good variety of prints! I never make that "I've done it before, I know what I'm doing" mistake...uh...ok, maybe a few times :) It's still a fun quilt, and I have that pattern, so now I'm inspired!